Nato says as many as 150 Taleban militants have been killed in a battle in eastern Afghanistan. "The insurgents had been observed gathering in Pakistan and had crossed the border prior to launching an attack," Nato said in a statement. It said Pakistan had helped monitor the fighters, who were then hit with artillery and air strikes. The Afghan defence ministry earlier estimated 80 fatalities. There was no independent confirmation of numbers. A Taleban spokesman said those killed were civilians, not militants. However, correspondents say there is very little civilian activity in the area of the attack. The spokesman, Dr Muhammad Hanif, told Associated Press news agency that the figure of 150 Taleban fighters killed was "a complete lie". The battle took place in the Margha hills in Afghanistan's Paktika province, close to the Pakistani border. The BBC news website has learned that at least four bodies of local Wazir tribesmen have been taken to the Miranshah area of North Waziristan on the Pakistani side. 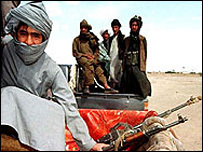 The Nato statement said two groups of Taleban were monitored and tracked as they crossed the border, and then attacked. "Initial battle damage estimates indicate as many as 150 insurgents were killed," it said. While the defence ministry put the death toll at 80, an Afghan commander, General Murad Ali, said only about 10 bodies were recovered. He personally estimated the death toll at about 50. It is not clear why the figures differed so much and Nato did not say how it had arrived at the figure. Gen Ali only referred to one group of fighters crossing the border. Meanwhile, Pakistan says its troops attacked pro-Taleban militants in North Waziristan. It is not clear if there were casualties or if the operation was linked to the battle on the Afghan side. It is the first raid by Pakistan's military since a peace deal with militants in the area in September. Major Dominic White, a spokesman for the Nato force in Kabul, told the BBC as far as he was aware there were no civilian casualties in the Paktika battle. The death of civilians has been a major issue in Afghanistan, with Nato saying last week that its biggest mistake of the past year has been killing innocent people. The alliance has been accused - including by President Hamid Karzai - of carelessness over civilian lives when attacking Taleban fighters. Last month Nato said 80 militants had been killed in an operation in southern Helmand province, but the death toll was later reduced to eight. If Nato's account of the latest battle proves to be correct it will be a notable success for the alliance as they prepare to counter an anticipated spring offensive by the Taleban, says the BBC's Dan Isaacs in Kabul. It is also significant, he says, that Nato officials said they had the close co-operation of the Pakistani authorities in monitoring the insurgents before they entered Afghanistan. Pakistan's Interior Minister, Aftab Sherpao, told the BBC it was a "classic case" of co-operation between Nato and Pakistani troops. He did not say what operational role the Pakistani troops played. The commander of Nato forces in Afghanistan, Gen David Richards, told journalists in Islamabad that increased Pakistani operations on the border had led to a reduction in Taleban activity towards the end of 2006. Afghan leaders have repeatedly called for Pakistan to offer more help in fighting the Taleban. Paktika province borders the Pakistani tribal areas of North and South Waziristan, where Pakistan has signed non-aggression pacts with militants. Afghanistan says this has allowed the Taleban to flourish and given them a base from which to launch an increasing number of attacks on its territory.